Last Friday I did a post about if I had to start over with my makeup. It was drugstore only & I loved posting about everything I am insanely in love with. I thought why not do the same only with hair products?! Here's the only problem with this logic... I rarely ever buy hair products at the grocery/drug store. So bare with me, but here's the products I'd go buy if I lost my luggage. Granted they are definitely not as cheap as the makeup, but they are products I can't live without! Shampoo & Conditioner: This one is definitely the toughest for me. I use so many different ones because my hair gets used to them quickly. I picked S Factor Smoothing Line for the main fact that it makes my hair so soft, smooth, & shiny! (My top 3 S's for great hair!) They are definitely pricey, but totally worth it. Leave-in Conditioner: This was too easy for me. It's definitely It's A 10 Miracle Leave In. This stuff truly is amazeballs. I won't lie, at the store it's $20 for 4 oz. but it's so worth it! I use this every.single.time I was my hair. I noticed a change immediately & will never use another leave in again! Smoothing Product: Again another super easy one for me to pick. My stylist gave me a sample of this stuff and I've been hooked ever since. Redken Smooth Lock Stay Sleek. All you need is a dime sized amount for long hair. Put it in after washing when your hair is still wet & it will be so smooth you will barely need a flat iron! It's perfection in my book! Hairspray: I'm not a huge hairspray person, but I do know that there's only 1 hairspray out there that's the best selling, non-sticky, keeps your hair in place without making it feel like straw product. Kenra Volume Spray 25. Flat Iron: This is the one my stylist uses on me & it will be my next flat iron because it's awesome... Babyliss 1 1/2" Pro Flat Iron. Curling Iron: Okay I've never tried this product, but heard from so many people (youtubers mainly) about the amazingness of this product. Nume Reverse Curling Wand. And I want it! Like now! 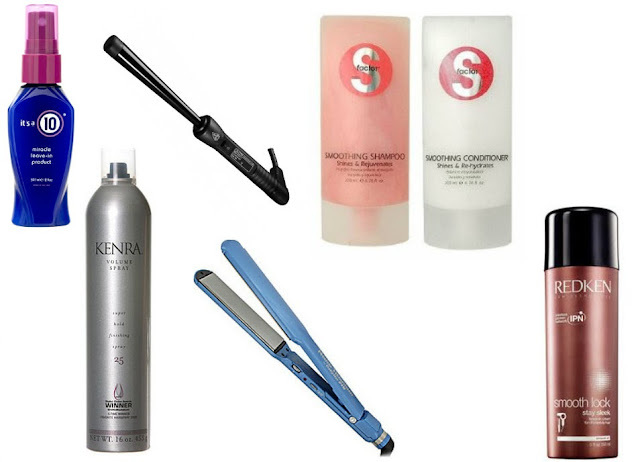 What's your must have's for hair products? I love that you take an interest in hair products....I am a big believer in using the right products for your hair type!